Clarifying the relative contributions of genetic and environmental (including grower management) factors to tomato fruit quality is challenging. The task is especially difficult when fruit characteristics of specific interest are difficult to induce experimentally. Color-oriented physiological and ripening disorders like blotchy ripening and yellow shoulder disorder (YSD) are in this category. They can be abundant in some situations but frustratingly absent in others. However, results from years of focused and collaborative research on the disorders help explain their origins and point to steps crop managers can take to avoid them. 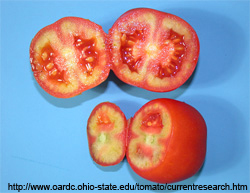 Collectively, blotchy ripening and YSD are characterized by patches of green, yellow, gray or pale red color in the flesh and/or skin of otherwise mature and healthy fruit that are expected to redden uniformly as they ripen (e.g., figure at right). Discoloration can result from attacks by pathogens and pests. Therefore, differentiating fruit displaying blotchy ripening or YSD as true physiological or ripening disorders from fruit exhibiting symptoms traceable to other causes is important. Blotchy ripening and YSD have perplexed growers and engaged scientists for decades. Technical articles referenced in the Extension Spotlight above provide historical context to the discovery of the causes of blotchy ripening and YSD. More recent contributions by Drs. Mary Peet and David Francis continue the process.In a review of the scientific literature on a set of major physiological disorders (e.g., blossom end rot, catfacing, sunscald, blotchy ripening and YSD), Dr. Peet concludes that the current consensus holds – blotchy ripening typically results from the exposure of susceptible cultivars to specific environmental conditions, including imbalances in soil fertility and extremes in temperature during mid-late stages of ripening.This general theme is also evident in an article and website offered by Dr. Francis. The article details the research team’s completion of a multi-year study involving 36 genotypes specifically to determine if YSD is caused by delayed fruit ripening or abnormal fruit development. They conclude that abnormal development, particularly a lack of cell enlargement, is at work in fruit displaying YSD. Other studies by Francis and colleagues also indicate that regions displaying incomplete cell enlargement also have significantly less lycopene. The authors conclude that YSD does not fit the classic definition of a ripening disorder.Additional research is needed to more fully characterize and prevent physiological and ripening disorders.